When a kart racer comes to a Nintendo platform it’s almost impossible to avoid any comparisons with Mario Kart; the moustachioed plumber’s racing franchise is widely recognised to be the best that the genre has to offer, and naturally sets a benchmark for others to aspire to. 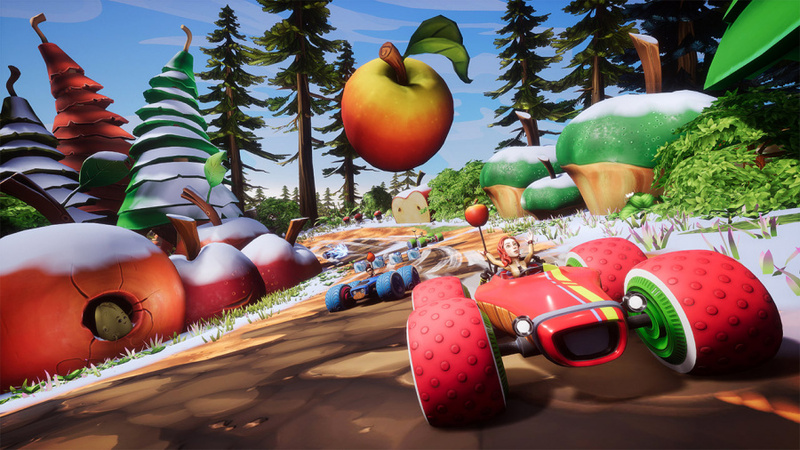 All-Star Fruit Racing does, unsurprisingly, bear a striking resemblance to Mario Kart in some areas, but also manages to come up with some new ideas that help it to claim its own identity. 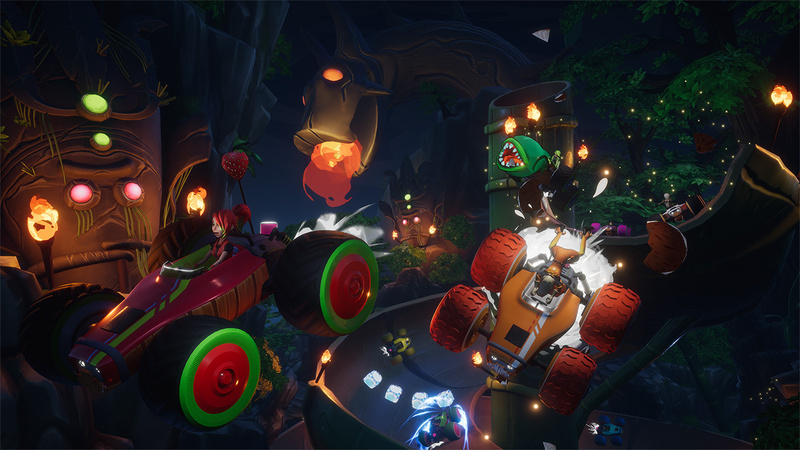 For the most part, All-Star Fruit Racing is the game you’re probably expecting it to be; players race around colourful circuits, collecting items that can be used to hinder opponents along the way, while ultimately aiming to come out on top as the champion of fruity karting. The main difference here, though, is the way in which players use and obtain their weapons, building upon the simple drive-through-a-floating-box trick we’ve seen countless times in the past. Your weapons are divided into four categories, each representing one of the four seasons, and on-track fruit collectibles allow you to fill up a corresponding gauge of your choosing. If you need an attack that fires in front of you, you can grab all the fruit that will fill up that juice tank; if you need something that can defend from incoming attacks, you simply fill up a different weapon gauge instead. It goes further than this, too, as filling up multiple gauges can create fusion-like attacks, taking on elements of all currently-filled tanks when fired. You can even disconnect individual weapon tanks to pick the exact weapon-type you want, or save up enough juice to use all four in one go for a super-duper fancy attack. Getting used to the different combinations can take some time, and you might find yourself simply using whatever attacks become available to you for simplicity’s sake, but the deeper option is there should you want to take the time to learn how it all works. You can jump into quick races, time attacks, or a career mode, which essentially presents you with championships not too dissimilar to Mario Kart’s setup, and an online mode is said to be coming in a patch just after launch. 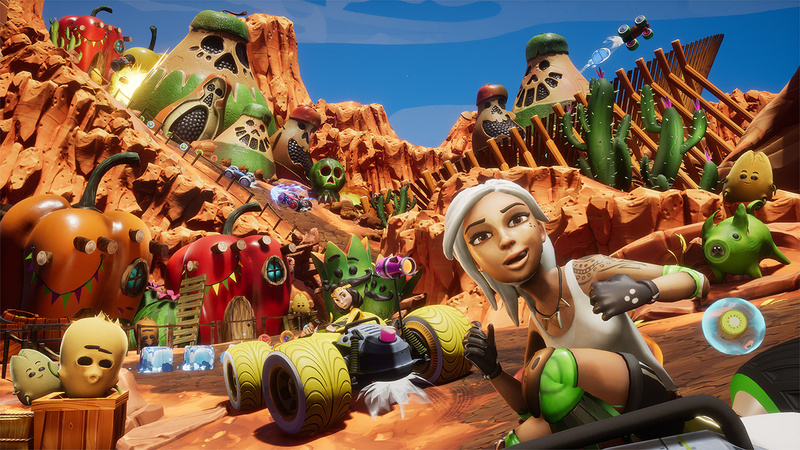 The quick races allow you to play with friends in local co-op (up to four players) for now, and you can tinker around with difficulty settings and the number of racers present on the track. Playing through these races, and progressing through your career, will unlock various customisation items – which actually leads us on nicely to our next point. 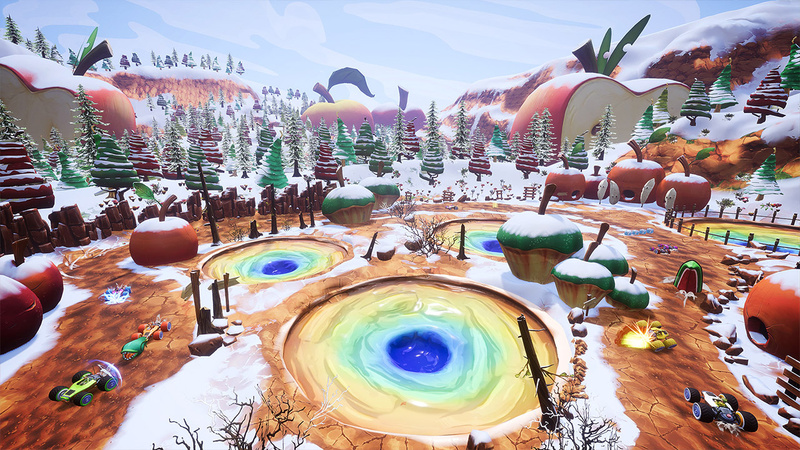 The game is clearly aiming for a bright, cute, and cheerful presentation, and it achieves this to varying degrees in different areas. The customisations for your karts are great, allowing you to choose from all sorts of crazy colours to show off your own style, and the tracks are littered with cute little fruit creatures and bold colour palettes, but things aren’t quite as gorgeous as we’d hoped when hurtling around the tracks. Visual textures tend to be quite fuzzy, particularly when in the distance, and certain scenery elements suddenly pop into a higher level of detail as you approach them. Playing the game in handheld mode seems to highlight these issues slightly more than playing with the console docked, although the game never quite looks as good as its creativity and funky car models deserve. Perhaps the main performance issue, however, is the loading screens. Waiting for each race to load, or even for the game to start, takes a strangely long time. We timed one such loading screen – which went from the end of a race back to the main menu – and it took 47 seconds. If you sit still for 47 seconds without doing anything, you’ll realise how long a time that actually is, and it causes quite a bit of frustration having to wait that long every time you want to start or finish anything in the game. There are a few other little niggles, too, such as career races feeling a little bit too long, often dragging on by having too many laps, or the controller button layout seeming a little odd. Because the face buttons have been used for selecting your juice tanks, the brake has been plonked on the ‘R’ button, leaving you to awkwardly reposition your finger from the ‘ZR’ accelerator whenever you want to slow down and trying to press in the right joystick to use attacks. They’re only relatively small issues, but they sit among several little hiccups that just prevent this game from being fully worth it for the asking price.